Other names: Chinese laurel, Salamander tree, buni, wuni, amati, pani heloch. 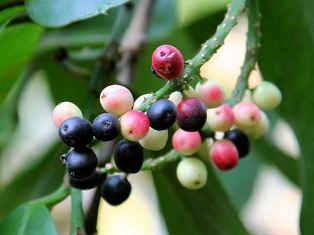 Bignay is found wild in the wetter parts of India, from the Himalaya southwards and eastwards, in Sri Lanka, Burma and Malaysia. This tree is cultivated extensively in many parts of Indonesia, particularly in Java and also in Indochina for its fruits. 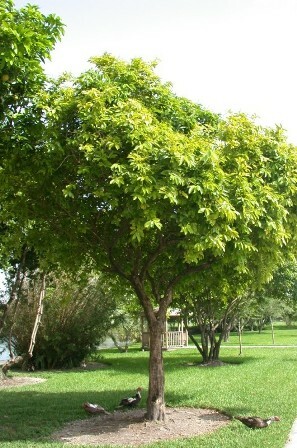 An evergreen dioecious tree, upto 10 m tall, with straight trunk, usually branched near the base. Leaves distichous, oblong late, 19-25 cm x 4-10 cm base obtuse or rounded, apex acuminate or obtuse, entire coriaceous, shiny, midribs strongly prominent below up to 1cm long. Inflorescences terminal or axillary, narrowly spicate or racemose, many-flowered, 6-20 cm long; male flowers sessile, calyx copular with 3-4 short, rounded, ciliate lobes, ca. 1mm x 3mm, stamens 3-4, reddish, ovary rudimentary on a fleshy disk; female flowers pedicelled, calyx copular-campanulate, 3-4-lobed, ca. 1mm x 2mm, persistent, ovary ovoid, stigmas 3-4, disk small; in female trees often a large proportion of the flowers is perfect. Fruit a globose or ovoid drupe, 8-10mm in diameter, yellowish-red to bluish-violet, juicy; seed ovoid-oblong, 6-8 mm x 4.5-5.5 mm. Ripe fruit can be eaten raw; it stains mouth and fingers. Unripe berries are rather sour and since the berries in a bunch do not ripen evenly, the fruit is often used to make jam or jelly. A small percent of people have a genetic trait to taste bignay fruit as extremely bitter. The edible portion is 65-80 % of the fruit. Per 100g the edible portion contains; water 90-95 g, carbohydrates 6.3 g, fat 0.8 g, protein 0.7 g, calcium 37-120 mg, phosphorus 22-40 mg, iron 0.7 mg, vitamin C 8mg, and vitamin A 10 IU. The energy value is 134 KJ/ 100g. Citric acid is the predominant organic acid. Juice of fully ripened fruit serves as a refreshing drink and yields an excellent wine. Indonesians prepare a sour fish sauce from the fruit. Young leaves are acidic and ar eaten with rice. These are also used to flavour fish or meat stew and both immature fruit and young leaves serve as substitutes for vinegar. The young leaves are also eaten in salads and cooked with rice. Bark and leaves contain an alkaloid which has medicinal use, but is also reported to be poisonous. Bignay can be easily propagated from seed, cuttings, air layering, even by budding, and grafting. But air layering is the most popular method and can form in 95 days. 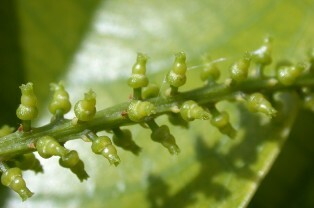 The asexually propagated plants start producing fruit within a couple of years. The fruiting season lasts only two months. Information on pests and diseases attacking Antidesma species is scanty. Termites, mealy bugs and scales sometimes infest the tree; a report from Singapore mentions an incident of severe damage to the foliage by beetle larvae (Autoserica rufocuprea). 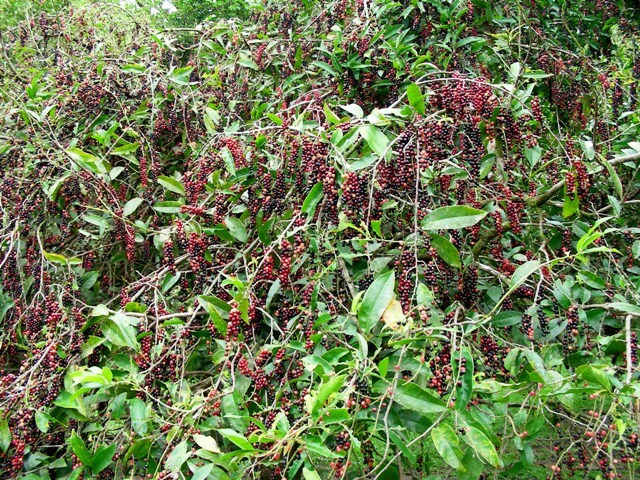 Bignay is a heavy bear can produce even upto 200 kg fruits in a season. Bignay is a fruit which can be promoted for cultivation. It has a business potential.